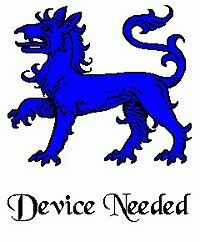 Argent, three scarpes sable surmounted by a merlin stooping to sinister wings displayed and a chief embattled azure. 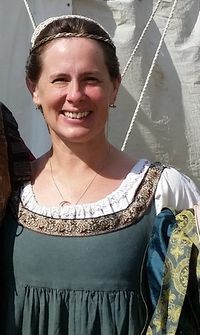 Mistress Charis is a 12th Century Welsh noble woman, skilled in the arts of cooking, spinning, knitting, tailoring, acting, singing, archery, riding, fencing, and calligraphy and illumination. She can usually be found in the kitchen. Autocrat, Wedding of Christine and Armando, 1995? Head Cook, 100 Minutes War, 11/1996? This page was last edited on 10 January 2019, at 21:55.